On your Android phone, you’re not limited to typing only the symbols you see on the alphabetic keyboard. Most Android phones feature alternative character keyboards. To access these special keyboards, tap the symbol or numeric key, such as the ?1J key. The number and variety of special character keyboards varies from phone to phone. At least one symbol keyboard is available, though you may find multiple symbol keyboards, special numeric keypads, and even emoji keyboards. Here, four different symbol keyboards are shown. To switch keyboards, locate the special symbols, illustrated here. Tap a symbol to view an alternative character set. 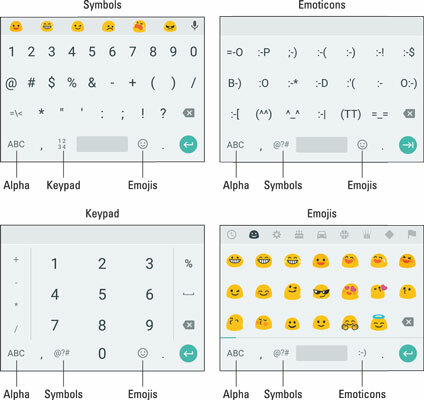 Though these symbols and the keyboards vary, nearly all Android phones use the ABC key to return to the standard, alpha keyboard. Some special symbols are available quickly from the alpha keyboard. These symbols include accented letters and other common characters. The secret is to long-press a key, such as the A key, shown here. Special symbol pop-up palette thing. After you long-press, drag your finger upward to choose a character from the pop-up palette. If you choose the wrong character, tap the Delete key on the onscreen keyboard to erase the mistyped symbol. Some onscreen keyboards show tiny symbols next to the letters and numbers. 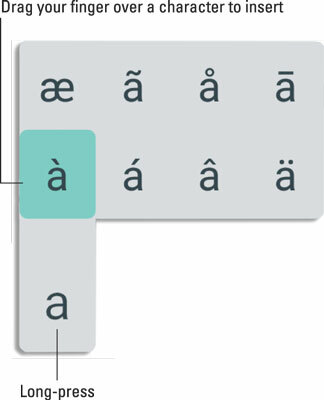 If so, you can long-press that key to access the symbol, similar to the technique illustrated. Emojis are tiny images that express words or concepts, such as those shown on the bottom right in the first figure above. The variety of emojis is almost endless; choose another palette from the top of the keyboard. Emoticons predate emojis. They use characters to create faces or other expressions. Unlike emojis, emoticons appear identical on every smartphone; emojis may look subtly different and not every phone sports the same variety.